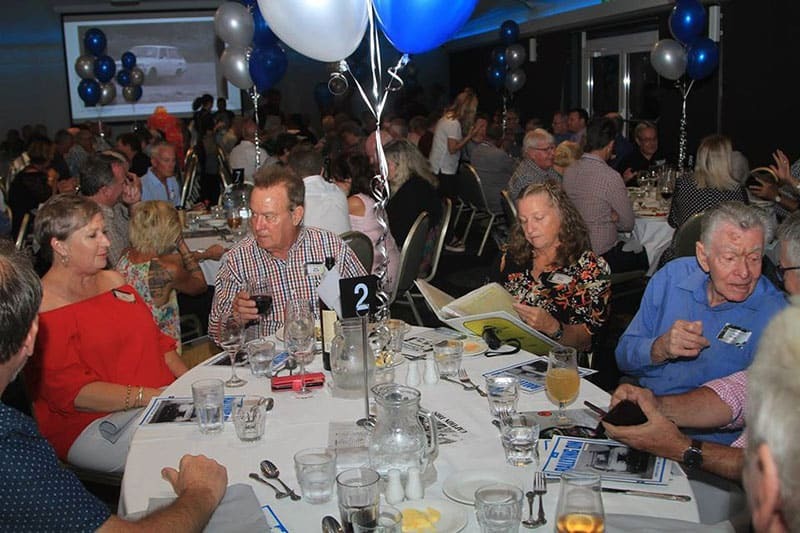 The Queensland rally community is known to regularly celebrate the sport and its personalities at the annual Queensland Rally Dinner, and by regular anniversaries in the south-east held by the Brisbane Sporting Car Club (BSCC). The BSCC is a club with a long history and record of producing events and champions. Queensland has also enjoyed a long and successful connection with the sport in Australia by virtue of an almost continuous link to the Australian Rally Championship, hosting an event every year for about 50 years continuously until 2016. In addition, Queenslanders have featured very strongly over that time in state, national and international arenas. Some of the quickest drivers and best-known teams have originated in the Sunshine State and been rewarded with many successes over the years. Some years ago a successful informal ‘rally dinner’ was held in the northern suburbs, which drew a great deal of support and a high attendance. It therefore seemed logical for another Rally Reunion celebration to be held in Brisbane, inviting all and sundry to meet up, remember past successes and tell stories of old. Dennis Brown took up the mantle and set to arranging the event in about October last year, spreading the word by Facebook, social media and word of mouth. It wasn’t long before people wishing to attend started flooding in, all keen to catch up with old friends and reminisce. A Facebook page set up to support the Rally Reunion attracted hundreds of members and in the past couple of months photos emerged out of various albums, most of which had probably never been seen before. Some of these black and white photos have perhaps never seen the light of day, and it was fascinating to gauge the reactions of competitors, past and present. Incredible powers of recall identified cars, crews, events, forests and even corners in some instances! As the night of Saturday, March 23 approached, some 210 people were on the final dinner list, with the event held at the Glen Hotel in the southern suburbs of Brisbane. Attendees included a wide array of champions from state and national level, including some with amazing international experience like East African Safari winner, Lofty Drews. An ‘Apology List’ of another 50 or so people reinforced the popularity of the concept, and with a capacity of 240 seated diners, the Glen may have been stretched to accommodate the whole group had they all shown!! Interstate guests attending including Ed Ordynski and Bruce Garland who took to the lectern as speakers, along with Ross Dunkerton and Lofty Drews who also both entertained the room. While many attendees travelled long distances across Queensland and interstate to make the dinner, past driver Tony Jewells – now resident in France – made sure that a planned trip to Australia included the Rally Reunion date. Whilst co-ordinated by Dennis Brown, himself a former Queensland Rally Champion in 1988, assistance came from many others, including his wife Sherry. Clair and Paul Buccini assisted with personalised, laminated place mats for each guest as a memento of the night. Graham Ruckert constructed a slide show of some 5000 scanned images from rallying over the years, ensuring that many of those present caught a glimpse of their former glory days. As a part of the BSCC archives, Rod Sams ensured that a series of yearly almanacs were laid out for anyone to leaf through and again enjoy a reminder of the events of past years. Finally, Peter Layton reproduced a lift-out from a successful Ipswich West Moreton event of many years past. While age is not a determining factor, some of the elder statesmen of the sport were proudly in attendance including Henk Kabel, Jim Reddiex, Allan Lawson, Garth Llewellyn and Les Baron. With the party petering out by about midnight, a small group continued on at the nearby Brown residence. Immediate feedback after the dinner was clearly in support of further such occasions and without being too sensitive about it, encouragement was given to a three-year gap to the next event due to the advancing ages of many of those attendees. Dennis is happy to hear from anyone interested in promoting the next rally reunion dinner in due course. Many photos and footage were taken during the night and most of that imagery is available on the ‘Brisbane Rally Reunion 23/02/2019’ Facebook page. In conclusion thanks from the rally community go to Dennis Brown and his team of helpers for making this a memorable and enjoyable evening.